Welcome to Linda Ikeji's Blog: To Todd Moss - Nigeria is NOT a failed State! To Todd Moss - Nigeria is NOT a failed State! The USA Deputy Secretary of State Jacob Lew in reaction to the Nigerian government seven-day ultimatum given to the United States authorities to remove Nigerians from their watch list, described the Nigerian action on CBS News as “so predictable” and that the US is more concerned about the safety of American Citizens. The snub came as former Deputy Assistant Secretary of State for African Affairs during the Bush administration Todd Moss describe Nigeria as a “FAILED STATE” with no visible leader to partner with the USA. After the plane bomber, where in the world is Nigeria’s President? Amid all the media frenzy around the Nigerian underwear bomber and how America should have stopped him before he tried to blow up a passenger plane on Christmas Day, a critical piece to the counter-terrorism puzzle seems to have been missed: where in the world is the Nigerian President? Normally, after such a horrific incident, President Obama would be on the phone with his counterpart, discussing what went wrong and agreeing on ways to work better in the future to prevent such attacks. But this couldn’t happen because Nigeria’s President Umaru Yar’Adua left his country for medical treatment in Saudi Arabia on November 23rd and hasn’t been seen or heard from since. Yes, you read that right: the whereabouts of the leader of Nigeria—America’s most important strategic ally in Africa, the fifth largest source of U.S. oil imports, and home to 150 million people—are unknown. It is also not clear if he is alive or dead. The situation is so uncertain that Nigeria’s parliament is openly considering sending a delegation to Saudi Arabia to find out the truth. A major opposition party yesterday demanded, quite reasonably, some “proof of life”. 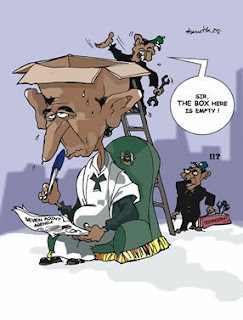 The mystery over Yar’Adua is so bizarre as to be comical—if the consequences weren’t so severe. His absence has thrust the country into an immediate constitutional crisis. The President failed to delegate authority to his deputy before travelling, effectively leaving no one in charge. This 43-days-and-counting power vacuum is being swiftly filled by an insular cabal bent on exploiting the situation for their own gain. Complicating matters, the vice president—ironically named Goodluck Jonathan—is a Christian and an Ijaw, part of a minority group from the southern Niger Delta region and far from the power centers of the northern Muslim elites who expect one of their own to run the country. There is much speculation that insiders are scheming now of ways to keep Jonathan from ever assuming power. In an ominous sign, a new chief justice was quickly (and possibly illegally) sworn in last week. These developments all put Nigeria’s future at great risk. A decade of constitutional democracy is threatened by the specter of mass violence and a possible military coup. The failed terrorist attack by Umar Farouk Abdulmutallab on Northwest Flight 253 highlights that Nigeria’s power void is dangerous for the U.S. as well. The foundation of a counter-terrorism strategy is to build cooperative partnerships with friendly nations. This means sharing information and helping to build security capacity in places like Yemen, Afghanistan, and Nigeria. But we cannot have a partnership if there is no one on the other end of the line. Nigeria cannot be a reliable ally if it is consumed by its own corruption and political machinations. In this way, Nigeria is rapidly becoming more like Somalia—a failed state with no real government to cooperate with—than a real partner. What can the United States do? First, it should insist on an immediate public declaration of President Yar’Adua’s health and fitness to govern. If the President’s staff refuse to oblige, then the U.S. should encourage the national assembly to assert its constitutional responsibilities when it reconvenes on January 12. Second, if, as seems likely, Yar’Adua is in fact incapacitated, the U.S. must demand that the constitution be followed and power transferred to the vice president. The long-term security of Nigeria depends on entrenching the rule of law and this must supersede any palace intrigue or political bargaining. Third, it is clear that whatever the outcome over the next few weeks, Nigeria will remain on a knife’s edge until elections in 2011. Any hope for a more stable country hinges on a credible election next year. Yar’Adua came to power in a deeply flawed poll in April 2007 and almost no steps have since been taken to fix the broken system. The U.S. is in a unique position to push for and help deliver a better election that would strengthen the authority and legitimacy of the next government. Last, the U.S. can support Nigeria’s vibrant civil society that is clearly fed up and is increasingly demanding change. The case of the missing Nigerian President is a wake up call to the United States about the vulnerability of many of our global partners. How we respond is not only crucial to the future of an important ally, but a critical test of our strategy for building partnerships in troubled places to combat the global ills of our time. Dear Mr. Todd, I agree you wrote a lot of truth in your article, we do recognize that we have a lot of issues in Nigeria that we need to tackle if we are to progress as a nation, I agree that we are led by corrupt leaders, I even agree that we have a dysfunctional government and like you said it's quite comical that we do not know the whereabouts of our President, I mean where does that happen? But I do not agree that we are a FAILED State. You see, every nation in the world has it's own problems; some worse than others, we are not in denial, we do know what our problems are in Nigeria and hopefully one day we will resolve some of them. But despite all the problems we have faced over the years, Nigeria is still standing, and will continue to stand because Nigerians are stong willed, we are a peace loving people, and we are blessed. How many African countries live off us? How many countries in the world rely on our natural resources? Please give us a break! You can not discredit 150million people because of the failings of a few people. Instead of trying to tear us down why don't we work together to grow our nation? PS, this is the only home I know...if I don't defend it, where else will I defend? I think it's time we stop pointing out all that is wrong with our nation and start looking for solutions. this attitude of America trying to dictate to us what to do is becoming way too much. Todd Moss should just better shut his mouth and look for something else to do. I don't believe Nigeria will ever be a failed state or that we will become like Somalia. i think America is trying to turn away attention fron their own failures and trying to put the blame on another nation. We've gotta say no to this crap coming from America or any other nation. nigeria is our only country. Let's begin to solve our problems ourselves. Linda; i am afraid the man spoke the truth, the whole truth and nothing but the truth. A failed state can still be a success though! Well written Rejoinder but the guy makes a point none of us can escape from. 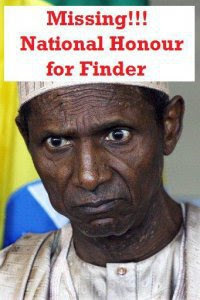 Where is Yar Adua? Lets see how the Ultimatum works out. Your problem like most Nigerians' is your inability to think objectively. It is our disdain for constructive criticism that has led us to our current state of affairs after 50 years of self determination. What a shame! For your education, if you still have the will to read, please get a copy of Failed States: The Abuse of Power and the Assault on Democracy by Noam Chomsky. 3. an inability to interact with other states as a full member of the international community. For your information Nigeria has been on the list of top 20 failed states since 2007. From his letter it made me a bit angry, why must it take the "United States" for Nigeria to be able to enforce its constitution. Its simply sad to me. I hope that someone will one day reign and kill off all the "embezzlers" just like the president in Ghana did. I'm not trying to make this a comparison to Ghana and Nigeria. But can you imagine what that one president did to regroup the economy? 200 Ghana Cedis, is 21,000 Nigeria Naira. It's sad to me, Im waiting for that ruler who is ready to fight to the death for "HONEST" politics. So that maybe in 25 years we can see Nigeria thrive more than its ever had before. (If I am stating untrue facts, please correct me when in terms to Ghanian's politics). so proud of you Linda, you're keeping on top of things despite your busy schedule. Nobody can like your home more than you. Those who are supporting America's role thinking they'll come and save us from the occasional religious violence will find the shock of their lives when it happens. There'll be turmoil in the land if they set foot here and Iraq may be child's play in terms of the devastation and the many (at least a million in Iraq) lives lost. I pray we do not look back at today if it happens in the future and wish to get back to the way things are today. As it is, the muslims and christians have found a way to live together despite the religious skirmishes. It will be dangerous if America polarises us further if they decide to start striking targets/military operations and suicidal recruits start pouring in from other countries and targeting our schools hospitals etc around Nigeria God forbid. Nigeria has problems but we must solve it ourselves. Meanwhile we need to sing it loud, where is Yaradua and we want answers NOW!!! Nigeria might not be a failed state yet, but we are treading a path that will eventually expose the frailty of our union. Nigeria as a nation through its successive Governments has failed its people, yet the common folks have not given up on the dream called Nigeria. The truth is that day by day this dream is getting harder and harder to hold on to. One fact is that to an extent we can coexist, but as a nation bound by one cord, we are far from achieving that, amidst the abundance of plenty, our tribalistic eyes are blinded by greed and a sense of them versus us. I am afraid that if we dont realize and acknowledge that we are Nigerians first, before hausa, ibo, yoruba, ijaw or Tiv, then we may as well invite leaders from each main tribe and decide amicable the divide of what is left of Nigeria. Abeg nigerians stop making noise. A child that does not learn at home will learn outside. Since those morons called leaders are not accountable to its citizens then it is good for them to be shamed outside. They have a point. Where exactly is that snail called a president?. since they won't answer that question to Nigerians then they should give an answer to Americans. Lol at Nigeria giving America ultimatums. We have everything to become a world super power so until our leaders stop being silly and actually develop the country, we are not forces to be reckoned with and are in no position to give America ultimatums. They dnt need us, we need them. and if we are honest we know it deep down. Where is our president? Do we have one? Please let's not full ourselves and but try to make inward changes it starts from me and you. Linda, many times the truth hurts especially when told by an outsider. Nothing this man said is wrong, one of our greatest problem is that we get overly emotional and never give or accept objective criticism about Nigeria. A country where people are used to armed robbery taking place at broad daylight, where people are kidnapped anywhere for ransom, and it is a very COMMON place is a joke. And no this isnt just something that happens across the Niger, I know folks who have been kidnapped even in Abuja and Lagos in recent months. One's leadership is a symbol of the country, so whether you like it or not, Yaradua is your representative, so if he is a failure then it shows that Nigeria as a whole is a failure. A country whose prez has been MIA for over 6 weeks, with no knowledge of his whereabouts is a joke. A country where parliament is trying to still pass 2010 budget with no account for what they did for 2009 budget is a joke. A country where they are trying to build VP a N4bil villa instead of taking that money to repair hospitals, or roads, where car accidents are the nation's leading cause of death is a joke! I can go on and on. Linda we are a big joke, and the sooner we accept it, and face it, and stop thinking that things like bringing KFC into Lagos will make us become great, or creating 1001 award shows every year will somehow make us exceptional. We Nigerians have developed a "I dont care attitude", face it, we are cowards who never do anything until stuff hits the fan. It took the US doing this, to get us to say something. Now we have Auntie Dora going about running her mouth saying crap to NTA, and BBC, as if that is going to change anything. Even with Prez being MIA, as soon as this happened, Mr VP should have been on the next flight to DC to meet with Obama or someone. If its to travel the world, they all know how to including Mr Ojo Maduekwe spending all those billions in 2009 gallivanting. What benefit has his travels done for us, we have no country rising to our support protesting our inclusion on the list!!! Its taken this to get us to start declaring ultimatums. Who gives a hoot. We are a failed state, and need to figure ourselves out. Do I think we deserve to be on the list? Nope! It takes accepting the truth first, before you can start trying to act on it, to get a solution. Linda and everyone else please accept it. signing off "i love my country I no go lie"...blah blah black sheep! This whole thing gets me agitated and so I try not to bother. The U.S is a bully and therefore preys on countries that are susceptible. And Nigeria is just that,.....a susceptible country and obviously not strong enough. First of, Where d hell is d leader of the country? I am sorry but Until naija cleans up its acts, it'll continue to face such humiliation. If Ghana could, Naija damn well could. Again, Nigerians with sentiments. Mr Moss or whatever his name said the truth. We have washed our dirty linen in the open glare of everyone so why do we complain of being labelled dirty.A people of over 150 million without a leader for over a month? You know the place of a head is not to be toyed with. When the head is sick all part of the body is equally sick. I am sorry but really we are tending towards a failed state. Natural resources abound truly but there is a wide disconnect between our resources and the state of the nation. Poverty is on the increase in a nation so richly blessed. Even some are using the President's absence to their own advantage. If they cannot come out in plain terms about the whereabout and condition of the president, then they do not feel the need to integrate the masses in their agenda! That''s very sad and my candid opinion is, if we cant tell ourselves the truth and someone else does, there is no need to crucify the person. We all hope for a better Nigeria, but right now, things are far from being normal, so lets all deal with it. Todd Moss comment on Nigeria is hundred percent right, he even put our situation mildly. We saw the various killings in the name of religion in the north by terrorists, we said that is their business we are not affected. Today, we are shouting because one of terrorists from the north took the act across Nigeria’s border. What do we call a case where people are being shot, sliced, beheaded, burnt alive, threw into the wells alive, smashed with heavy objects, pestles and religious centres and properties burnt on daily basis in the name of worshipping God? Two years ago, a female youth corps member teaching in a secondary school in one the northern states was beheaded for a mere allegation of throwing a Quran aside after retrieving same from a student who was cheating in an examination hall. Just last year another female youth corps member was brutally murdered in Borno State. What manner of terrorism is more grievous than these acts? We saw an Umaru Abdulmutallab, a religious zealot who contravenes the secular nature of our constitution by introducing Nigeria's first Islamic bank, Jaiz Bank International Plc in 2003, we said it is not our business because obedience to the spirit of the Nigerian constitution is meant for some part of the country, who seems to be sub-humans. Today, the hawks in government circles are shading crocodile tears because the United States has subtly told them to look inward by restricting their lavish trips abroad where they lodge money and waste the country’s funds on ostentatious items. you sef Linda! how can you defend the indefensible?? Nigeria, if not a failed state, is well on the way to becoming one. being peace loving pple wont get us anywhere! perhaps we need to be less peace loving and revolt! Our country is a joke, and fast becoming irrelevant to the rest of the world. Mr Moss has spoken nothing but the truth. take it as constructive criticism, instead of derriding him and defending just for the hell of it. You think we sef no love our country?? Sorry Linda, but on this occasion, and it’s a first in my book you got it wrong. Nigeria ticks all the boxes of a failed state, have a look at the classification of a failed state. I choose to call it a failing state for now, but fail it surely will. I used to be deluded, even though I lived in a state that worked and couldn’t be compared to one – like Nigeria - that didn’t. Was it blind patriotism, maybe. I just blindly defended my country. But not anymore, let’s call a spade a spade in order to fix all that is wrong with our country. Let’s not be fooled by a little sprinkle of modern amenities, by and large we are many miles away from being termed a successful (and some say a civilized) nation! Until Nigerians start realising that we have problems, then we would all remain where we are. Nigeria is not a failed state and who so ever says that should go jump off a cliff. The problem with Nigerian’s is that we are not patriotic at all. IF you look at all the other African courtiers we are far better than they will ever be. Is it Kenya, Uganda even Ghana we want to compare ourselves with those countries economy is ran by Chinese, Indians etc, or is it south Africa we want to say is better than Nigeria hell no, south Africans economy is ran by the white man. Nigeria is probably the only black nation that our economy is ran by our people which should stand for something, Nigeria is also the strongest black nation when it comes to our military (am sure most people did not know that). With that being said, we still have some major improvement that still needs to be done in Nigeria, and right now I am tired of Nigerian always complaining about how useless the country is ( Do not ask what Nigeria can do for you but what you can do for Nigeria) Nigeria need people to start acting not complaining. During Sani Abacha’s time no Nation, even powerful USA would use their fowl mouth to put down Nigeria. You can ask the British, especial their airline industry what they suffered when Abacha was in power. As much as I want to declare Nigeria a failed state, I can't because it doesn't meet the definition criteria. It takes more than rampant corruption and absence of public services to earn failed state status. That label requires consensus endorsement by the international community and loss of territorial integrity. However, in many ways, we are worse than a failed state and very close to being one. I'm more concerned about the scrotum bomber. Anyone else think that it's mightily convenient that his attack coincides with Yar'adua's perhaps untimely demise? Well, let us hope it's not a PSYOPS(psychological operation) to get the world ready for a US led invasion if they deem it necessary. Like it or not, we exist to provide them 12% of their oil supply. Only God knows what the real numbers are when you consider state sanctioned bunkering. But make no mistake, when you are ranked 5th place in oil imports to the US, just above Iraq, you don't have the luxury of having nationwide disruptive politics. So if you think that they'll let all that oil go offline because of the side effects of one dead president, think again. NIGERIA IS A FAILED STATE....I CONCUR AND I WISH WE NEVER GOT THAT INDEPENDENCE..ALMOST 50 YEARS OF INDEPENDENCE,WHAT DO WE HAVE TO SHOW....I WISH THE COLONIAL MASTERS WERE STILL HERE...AT LEAST WHETHER THINGS WOULD HAVE BEEN BETTER. While I don't agree that Nigeria is a failed state, I believe Nigeria is ran by a failed Gov. I mean of Obama wants to partner on anti terrorist policies who shall he partner with? It has become quite comical even to white people and Americans that our President would leave office for 43 days and counting with no word on his welfare. They do indeed take us for fools. As for Naija giving an ultimatum to America, let us all ask ourselves if we can survive without America. How many of our relatives live, work, school, vacation and visit hospitals in America because there is no provision for it here. We are in no place to give ultimatums! We can only try to partner and that is equally impossible with no president who can do it. The guy pointed out some good truth .Yet what people responded to ,is his suggestion which to them looked so brash..Remember dudes we are in a global village,others are watching us ,bcos in a global village there is no hidden place for anyone when your neighbour catches cold ,you catch fever. we know that Nigeria has problems but to call us a failed state is rich coming from this Todd Moss guy- afterall, black americans were only 'liberated' in the 1960s- until then, they could not mix with white people. Despite their 'black' president, the US remains as racially divided as ever, homosexuals are taking over their society and there is an increasing gap between rich and poor- such is the level of poverty in the US that it is shocking! Also the US itself is home to some of the most dangerous fundamentalist groups in the world- the klux klan and another group which produced Tim McVee who went on a campaign of terror in Ohio. Not to mention of course that this is a nation where the right to carry a gun is enshrined in the constitution. If anything, the US is a declining superpower and they know that the American Dream is flawed. In the meantime the time has come for nigerians to stop talking and take matters into their own hands- we must have a revolution that will transform our country, our society and start dealing with our problems. Would you have preferred the word "failing"? Truth be told that Nigeria has consistently fallen short of its expectations and for such a "great" country, it is quite pathetic and very embarrassing. I love my country no doubt, but I refuse to be ruled by sentiments - a major shortcoming of many Nigerians. I think it's better to face the facts and try and proffer a solution to the existing problems rather than "hope" things will get better just because we love our country. Tell me something. If your dad went away on vacation, the only logical thing would be for him to delegate responsibility to your mum or even the eldest child to ensure things went on smoothly in his absence. I think it is extremely irresponsible for the President to have left his seat even for a day without handing over power to his Vice. People please this this is a country not someone's pet project! I have heard so many stories in the past one year; planes stuck in the air for hours because the control tower had no electricity, the loss of jobs, the misuse of public funds and, in my case, the purchase of stocks without my permission. I mean like really now! When is this going to stop?! So please, let's leave sentiments out of this and listen to reason. OK! So Nigeria is a "failed" state! No point living in denial. The question is what do we do about it?! How exactly do we plan to rise out of the ashes?! The sooner we answer these questions, the better for us.